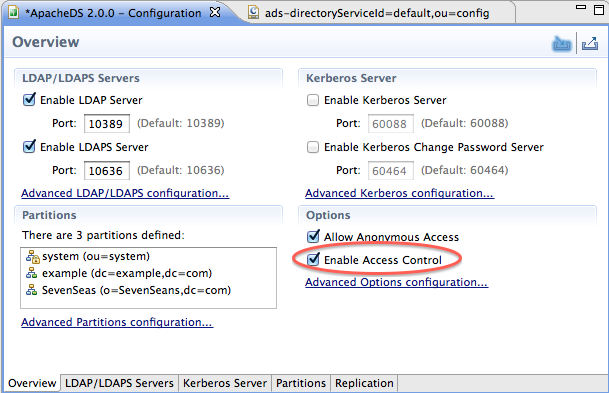 This section describes the default authorization functionality of ApacheDS 1.5, which is very simple. On the other hand, it is inadequate for most serious deployments. Therefore a basic example to the "real" authorization subsystem is provided as well. After authentication of a user or an application (or more generally an LDAP client) against the directory server (or attaining anonymous access respectively), certain LDAP operations will be granted or rejected, according to configuration and certain rules. This process of granting access is called authorization. Authorization for directory operations is not strictly standardized in the LDAP world, RFC 2829 - Authentication Methods for LDAP describes various scenarios and concepts, but does not enforce a concrete implementation. Thus each product comes with its own authorization feature. So does ApacheDS. A powerful authorization subsystem is provided since version 0.9.3, but disabled as a default. In order to accomplish their authorization functionality, software components often take advantage of LDAP groups stored within the directory. groupOfNames and groupOfUniqueNames are common object classes for groups entries; they contain the DNs of their members (users, other groups) as attribute values. In order to illustrate this, the "Seven Seas" example partition contains such group entries below "ou=groups,o=sevenSeas". Here the entry of a group describing the HMS Bounty crew (before the mutiny) in LDIF format. In such a scenario, a user, who is directly or indirectly member of a certain group is permitted to do something. The software component acts as a normal LDAP client and determines group belonging with the help of ordinary search operations. This is widely used but has nothing to do with the authorization for directory operations as described in this section (except that the client needs the permission to search the data). Learn more about best practices in this area in the article Practices in Directory Groups. Further examples in this guide are the Tomcat and Apache HTTPD integration sections. Without access controls enabled all entries are accessible and alterable by all: even anonymous users. There are however some minimal built-in rules for protecting users and groups within the server without having to turn on the ACI subsystem. They are used in the following examples, in conjunction with o=sevenSeas, to describe the default authorization rules. Without ACIs the server automatically protects, hides, the admin user from everyone but the admin user. Here a sample search operation in order to demonstrate this protection. The same command is submitted three times with different users. Users cannot see other user entries under the 'ou=users,ou=system' entry. So placing new users there automatically protects them. Placing new users anywhere else exposes them. Groups defined using groupOfNames or groupOfUniqueNames under the 'ou=groups,ou=system' are also protected from access or alteration by anyone other than the admin user. Again this protection is not allowed anywhere else but under these entries. For simple configurations the described rules should provide adequate protection but it lacks flexibility. For advanced configurations users should enable the ACI subsystem. This however shuts down access to everything by everyone except the admin user which bypasses the ACI subsystem. Directory administrators should look at the documentation on how to specify access control information in the Advanced User's Guide. User "cn=Horatio Nelson,ou=people,o=sevenSeas" should be able to perform all operations (delete, add, ...) below the base "o=sevenSeas"
A restart of the server is necessary for this change to take effect. Create an operational attribute administrativeRole with value "accessControlSpecificArea" in the entry "o=sevenSeas". A new attribute value should added to the previously created Subentry's prescriptiveACI attribute to grant search and compare permissions to all users. A new attribute value should added to the previously created Subentry's prescriptiveACI attribute to deny search and compare permissions for userPassword attribute to all users. The following LDIF file ([^authz_sevenSeas.ldif]) provides a set of changes made to directory entries in the "Seven Seas" data. In total it performs the steps described above. # Create an operational attribute "administrativeRole"
# with value "accessControlSpecificArea" in the entry "o=sevenSeas". # to all users and to deny search and compare permissions for userPassword attribute to all users. It is also possible to use graphical tools; some of them offer the feature to perform operations given in LDIF. After successfully applying the changes to the sample partition, one may ask how to check whether it works. We therefore perform some operations with the help of command line tools. Some will be permitted, some will not (and cause an appropriate error message). It would also be able to check this with the help of graphical tools (you might like to do this instead). But it is easier to document the parameters used with the help command line arguments. -b "o=sevenSeas" -s sub "(uid=hhornblo)"
-b "ou=system" -s sub "(objectclass=person)"
Until now the authorization only hided data (entries, attributes) from users with insufficient access rights. Let's perform some operations which try to manipulate the directory data! Afterwards a new entry is successfully created within the "Seven Seas" partition by user "Horatio Nelson". The '+' sign in the attributes list of the ldapsearch command causes ApacheDS to return the operational attributes, which demonstrate this. Performing the modification with the ldapmodify command line tool again fails for users other than "Horation Nelson" (who is allowed to due to the authorization configuration) and "uid=admin,ou=system". Now it is finale time. A demonstration on how to delete the villain's entry from the directory. With an LDIF file (Captain hook delete) with an appropriate change entry, this can easily be accomplished, if the bind user is allowed to do so. The entry "cn=James Hook,ou=people,o=sevenSeas" has been successfully deleted from the partition. Our little demonstration on how the ACI subsystem with a realistic configuration behaves end here. Learn more about it in the Advanced User's Guide. Practices in Directory Groups describes how to use groups within LDAP directories. Highly recommended.